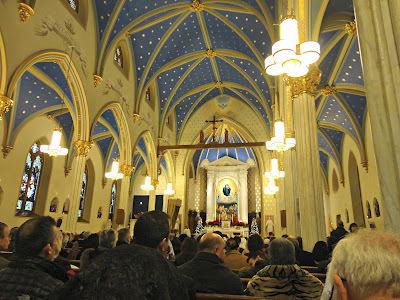 The Traditional Roman Rite of the Mass lies at the very heart of Saint Mary’s parish. Since Father Markey introduced it in the parish some seven years ago, it has become integral to the very existence of this parish both in spiritual ways and in eminently practical ways. The Solemn Mass on Sunday has brought so many new people to the parish and continues to be a source of inspiration and genuine prayerful worship to all who assist at the Mass. 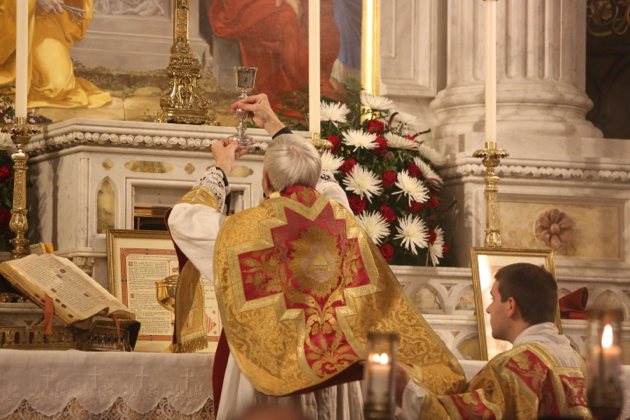 The Traditional Mass, also known as the Extraordinary Form, is a gift from God via Pope Benedict to St. Mary’s. When God gives someone a gift He expects it to be used for His glory and to be part of the missionary effort of the Church to bring the Good News of Jesus Christ to the world. In our case, I have decided that this gift needs to be used even more deeply in the parish than up to this point. After much thought and prayer, I have decided that the daily morning Mass will be celebrated in the Extraordinary Form. The time of the Mass will be moved to 7:30 a.m. to allow more people who go to work early to attend Mass. The readings will be in English. The quiet simplicity of the Low Mass will enrich us all. Cardinal Sarah’s book on Silence specifically mentions the silence of the Canon in the Extraordinary Form as something very good for the worshipping community. Most of our parishioners will notice little change, since we celebrate the daily Novus Ordo Mass in continuity with the form of the Traditional Mass. This change will also enable more of our parishioners to experience the beauty of the Extraordinary Form and enrich their understanding of the worship of the Church in the Holy Sacrifice of the Mass. In no way should this change to the daily celebration of the Extraordinary Form be interpreted as a “return to the past”. As Pope Benedict said: “What was sacred then is sacred now.” We live in the now, not in the past. And we look to the future with confidence that the presence of the Extraordinary Form at St. Mary’s will be a force within the Church to worship God in the Spirit, the God of Truth, Beauty and Goodness. The return to the Tradition of the Church is absolutely necessary in an age of spiritual amnesia within the Church that has sapped her strength to be who she is: the presence of Jesus Christ in the world. Your support, as always, is very important to me. Let us pray for each other and our beloved parish church dedicated to Mary most Holy.